Navigation Product Search All Categories STERLING SILVER ZEEWO Chinese Sterling Silver Cocktail Shaker, Tray and Cup Set. 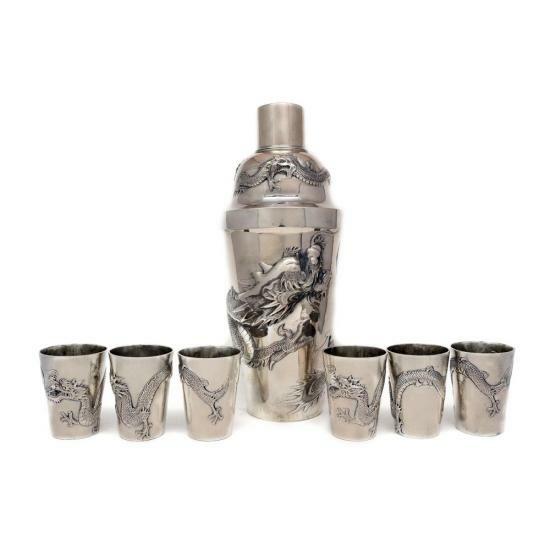 An Impressive chinese cocktail shaker, tray and 6 cups. Cups and Tray are marked and named in chinese and english. Shaker Height 260mm. Weight 450 grams. ZEEWO: A Chinese Export Silver Maker in Shanghai Circa 1870 to 1930.